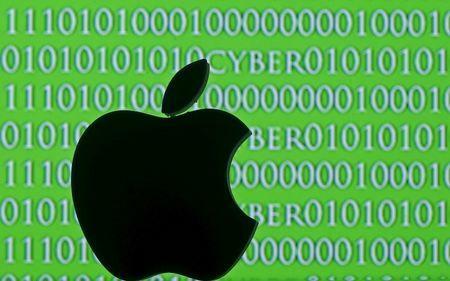 (Reuters) - U.S. prosecutors said Monday that a "third party" had presented a possible method for opening an encrypted iPhone used by one of the San Bernardino shooters, a development that could bring an abrupt end to the high-stakes legal showdown between the government and Apple Inc .
A federal judge in Riverside, California, late Monday agreed to the government's request to postpone a hearing scheduled for Tuesday so that the FBI could try the newly discovered technique. The Justice Department said it would update the court on April 5. The announcement on Monday that an unnamed third party had presented a way of breaking into the phone on Sunday - just two days before the hearing and after weeks of heated back-and-forth in court filings - drew skepticism from many in the tech community who have insisted that there were other ways to get into the phone. In a statement, the Justice Department said its only interest has always been gaining access to the information on the phone and that it had continued to explore alternatives even as litigation began. It offered no details on the new technique except that it came from a non-governmental third party, but said it was "cautiously optimistic" it would work. "That is why we asked the court to give us some time to explore this option," a spokeswoman for the Justice Department, Melanie R. Newman, said. "If this solution works, it will allow us to search the phone and continue our investigation into the terrorist attack that killed 14 people and wounded 22 people." An Apple executive told reporters on a press call that the company knew nothing about the Justice Department's possible method for getting into the phone, and that the government never gave any indication that it was continuing to search for such solutions. Nate Cardozo, staff attorney at the Electronic Frontier Foundation, a civil liberties group backing Apple, said the San Bernardino case was the "hand-chosen test case" for the government to establish its authority to access electronic information by whatever means necessary. In that context, he said, the last-minute discovery of a possible solution and the cancellation of the hearing is "suspicious," and suggests the government might be worried about losing and setting a bad precedent. "The problem is not going away, it's just been delayed for a year or two," he said. In opposing the court order, Apple's chief executive, Tim Cook, and his allies have argued that it would be unprecedented to force a company to develop a new product to assist a government investigation, and that other law enforcement agencies around the world would rapidly demand similar services.